Box No.381 MK.1. Red painted metal tin approximately 9 x 6 x 3cm. This originally contained 3 red star distress flare cartidges 'Signal 1" Red MK.XII.T'. for use with a 'Very' signal pistol. These were most commonly issued with the multi-man dinghies to enable the downed airmen to attract the attention of passing aircraft or ships. 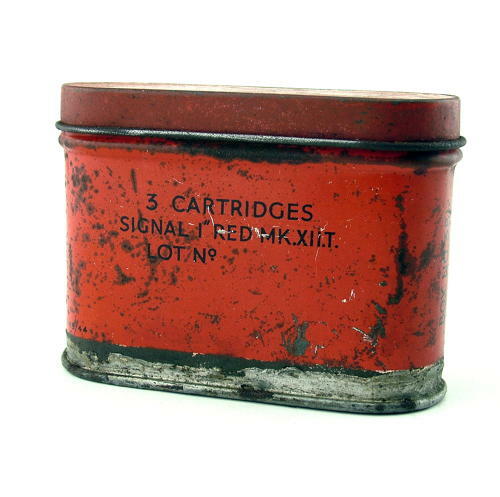 The tin was manufactured by The Metal Box Co. in 1944. It has some surface wear and paint loss. Empty. See p. 68/9 of 'Luftwaffe Vs RAF' Vol. 2 for further information. Stock code S121327.